You may have heard the following pledge when you attended an assembly at Perritt Primary: “I promise to do my best every day to be a bucket filler, not to dip, and to use my lid for myself and others at home, at school, and everywhere I go.” Or maybe you have seen the crafty bulletin boards at Central Primary and Peake Elementary encouraging students to be “Bucket Fillers”. 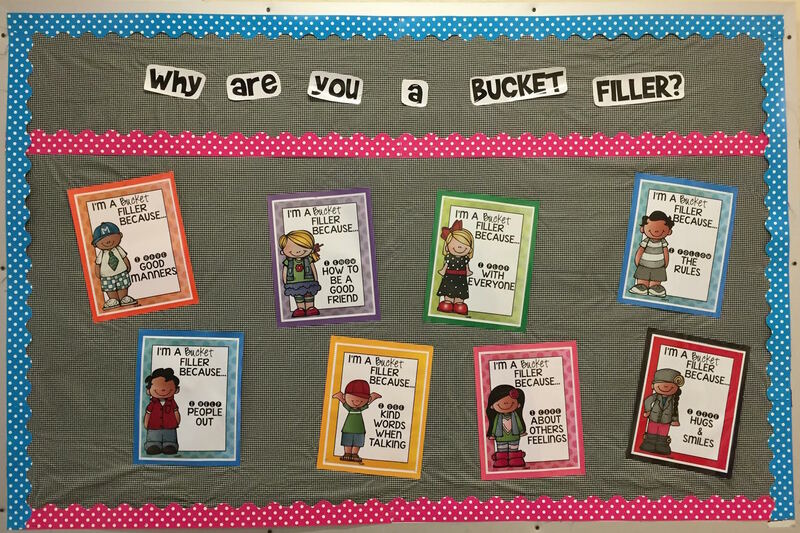 What is a bucket filler? Are you a bucket filler? The book explains that each person has an invisible bucket over his or her head that represents our mental and emotional self. When the bucket is full, we feel happy and confident. When the bucket is empty, we experience negative feelings. There are two types of people that contribute to empty and full buckets, bucket fillers and bucket dippers. Bucket fillers use actions and words to build others up, which results in a full bucket for both the giver and receiver. Bucket dippers use their words and actions to disrespect and tear others down, which dips into the bucket of the giver and receiver and takes away positive feelings. Students at Central Primary are rewarded when they are seen using bucket filling behavior. Teachers fill out a form explaining the child’s positive words or actions. The following morning, the forms are read aloud to all teachers and students during the Central Morning Show to spotlight all of the bucket fillers. The bucket filler forms are then placed on a bulletin board outside of the cafeteria for everyone to see. Central also encourages the students to spread bucket filling behavior into the community. Each week, one student from each class takes the “Bucket Filling Bag” home. The bag consists of a notebook and “Have You Filled a Bucket Today?” Parents are encouraged to read the book to their children, write down ways their family could fill buckets in their neighborhood or community, actually perform one of the ideas and write about their experience. Students bring the bag back the following week and share their experience with their class. Over time, Perritt Primary and Peake Elementary also implemented bucket filling to reinforce positive behavior. Perritt Primary focuses on filling three different buckets: the student bucket, the classroom bucket and the school bucket. Each student is given an individual bucket to represent his or her mental and emotional self. Students fill their individual buckets with “warm and fuzzies” (assorted pom poms) by exhibiting positive behavior or saying kind things to others. Once a student fills his or her own bucket, he or she receives a personal reward from the teacher and pours the “warm and fuzzies” into the classroom bucket. Once the classroom bucket is full from the students’ individual buckets, the class as a whole receives a reward, and the classroom bucket is poured into the school bucket. The school as a whole receives a reward when the school-wide bucket is full from all of the classroom buckets. By the time they reach Peake Elementary, students have had five years to learn what it means to be a bucket-filler and practice bucket filling behavior. Bucket Fillers, Inc. has been operating since 2006. According to their website, the goals of Bucket Fillers, Inc. are “to create more rewarding lives and a positive culture as you increase kindness, respect and courtesy”, “to decrease mean-spiritedness and negativity” and “to learn how to keep your bucket filled by understanding and rising above occasional bucket-dipping situations.” For more information on Bucket Fillers, Inc., visit www.bucketfillers101.com.